These craft projects feature craft techniques that can be used to add colorful designs to paper crafts, scrapbooks, fabrics and household objects. Apply what you learn in these craft projects to decorate other craft projects, in gift wrapping, and in home decorating. 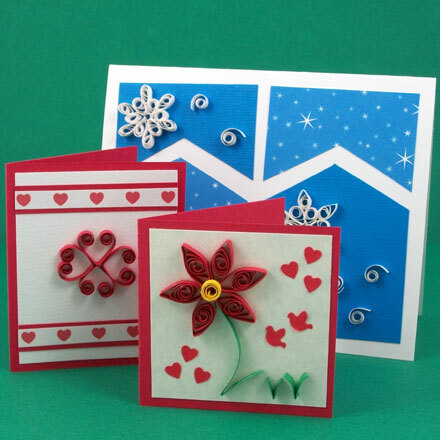 Christmas Quilling - Quilling, the art of rolling narrow strips of paper into coils or scrolls, is a wonderful way to decorate boxes, tags, and cards. It can also turn a simple craft item into an elegant gift. 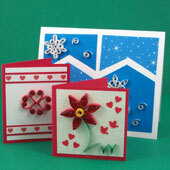 This project includes Christmas quilling designs and examples of how to combine quilling with handcrafted items. Stenciled T-Shirts - Take a plain T-shirt or a tired old T-shirt and perk it up with stenciled designs. These super-easy embellishments are a great way to rescue a T-shirt that has been stained. The same technique can be used to stencil sweatshirts and sweatpants—just about anything made of fabric. Stenciled Flower Pots - Turn a plastic flower pot from ordinary to extraordinary with stenciling. In this project, you will learn how to apply acrylic paint stencils to a small plastic flower pot. This technique can then be used to decorate large plastic flower pots, plastic hanging baskets, plastic wastebaskets, or just about any plastic container. Decoupage Box - In this project, you will learn the basics of decoupage by decorating a box made from cardstock with images printed on your color printer. The same technique can be used to decoupage wooden boxes, glass vases or plates, etc. With the wealth of images available for downloading and printing, this traditional craft is well-suited to modern times. Simple Paper Cutting - In this project, Aunt Annie introduces you to the art of paper-cutting through the techniques of cut-apart and layered paper. These techniques can be used to decorate greeting cards, stationery, boxes, gift wraps, or any paper craft project. Basics of Quilling - Quilling is the art of rolling narrow strips of paper into coils or scrolls, and arranging them to form elegant filigree. In this project, you'll see how to use a toothpick to roll coils and scrolls then pinch, shape, and arrange them into decorative patterns. Magazine Holder Friday Fun - Here’s a craft that is fun to do, recycles empty cereal boxes, and organizes those stacks of magazines, paperback books and miscellaneous papers around the house or in your child’s bedroom. Mexican Yarn Painting - The crafts of Mexico are renowned for bright colors and bold designs especially the nierika made by the Huichol people. In this project learn how to do Huichol-inspired yarn paintings then use the technique to make decorative plaques or to enliven the surfaces of boxes, cards, notebooks, and more.